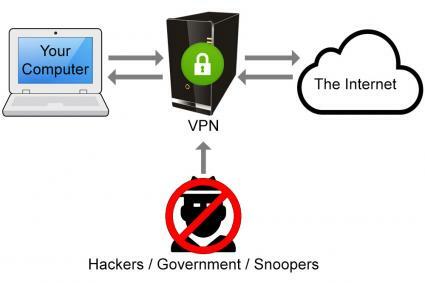 Using a virtual private network (VPN) server can allow Internet users to access websites and online resources anonymously, in a safer and more secure fashion than with a traditional connection. VPN servers can be used not only on regular desktop and laptop computers, but also on mobile devices like tablets and smartphones, as well as other Internet-connected devices. What Does a VPN Server Do? When a device normally connects to the Internet, it is making a mostly direct connection with the destination website or online service. Through this process, an abundance of data may be logged by both the Internet service provider (ISP) and the website. Much of this is gleaned by the IP address or Internet Protocol address, which can identify your physical location, your ISP and more. The websites you visit and the services you use may also be recorded. A VPN server provides is greater anonymity and Internet privacy. By using a VPN, you are effectively bypassing the traffic routing of the ISP, because all Internet activity is routed first through the VPN. The ISP becomes unaware of a user's web activities. From the destination website's perspective, this also makes it appear as if the user is accessing the Internet from the VPN server and not from his or her actual location. In other words, if your actual IP address is 1.2.3.4 and the VPN's IP address is 5.6.7.8, then the website will see you as being located at 5.6.7.8. Rather than connecting directly with a website or online service, using a VPN provides an added layer of security and anonymity. It achieves this by acting as an intermediary. The user connects to the VPN and the VPN, in turn, connects to the target website or online service. The connection between the user and the VPN server is fully encrypted, meaning all data that passes through in either direction is converted into a secret code. Should this data be intercepted by a third party, it would be unintelligible without first decrypting it. Contrast this to a standard, unsecure Internet connection where data can be much more easily spied upon. Once the data or web request arrives at the VPN server through this 'encrypted tunnel,' the VPN server then proceeds to connect to the website or online service accordingly. Data received from the website once again passes back through the VPN server and gets encrypted before being delivered back to the original user. Some companies may set up their own on-site VPN server. This is not for accessing the world wide web, per se, but rather to allow employees to access the company intranet remotely. Network administrators at an office may configure the internal network such that it can only be accessed when a computer is at the same site. This is typically for security reasons. By establishing a VPN, employees can connect to the network by making it appear as if they were physically at the office. There are many reasons why someone may want to make use of a VPN server. Increased security: Particularly when connecting to the Internet through public access points like coffee shops and libraries, users may be vulnerable to snooping, hacking and data theft. The encrypted tunnel provided by a VPN protects a user's data from such malicious attacks. This is especially important when traveling and while using sensitive websites like online banking. Avoid tracking: Websites and online services have ways of tracking your online activity, as might be the case with online shopping. This can be avoided, in part, by utilizing a VPN server. Circumvent ISP logs: If you do not want your Internet service provider to know what websites you are visiting or what services you are using, a VPN server can get you around that. An ISP may sometimes block a user's traffic for whatever reason. A VPN can hide your activity to prevent that. Access global content: Some web content may be blocked in your country. With a VPN, you can make it appear as if you are physically located somewhere else in order to access this content. A common use is with video streaming services where content may be restricted to certain countries. Bypass other restrictions: Network administrators may block access to certain websites. This happens on a national scale in countries like Brazil and China. By going through a VPN, you can bypass these restrictions and surf the Internet as if you were somewhere else. Using a VPN offers many key benefits and advantages. All web traffic is encrypted for added safety, security and privacy. Works for your entire Internet connection and not just for your browser or certain apps. Can be enabled and disabled with a single button. Compatible with a broad range of Internet-connected devices and services. Creates a more anonymous web browsing experience. Despite its appeal, a VPN server may not be for everyone. Typically comes with a monthly fee of around $5 to $10. Software must be installed on the device to be used. May result in slower Internet speeds as data must be encrypted and pass through the VPN server. Locations vary based on the VPN service provided. Certain uses may violate the terms and conditions of some online services. In an age where online privacy and security concerns are steadily on the rise, a VPN server can provide the added layer of protection that many consumers may desire. The ability to browse the Internet as if you were in a different part of the country or a different part of the world certainly has its appeal too, unlocking a wealth of content that may not otherwise be accessible. VPNs may not be for everyone, but they can be an invaluable tool to those who want it.